The historic capital of the Inca Empire, Cusco is situated 3,400 m above sea level, so you'll need at least a day of acclimatising before doing anything else. After Australia hosted APEC in 2007 which involved some chasing round, for 2008 it was Peru's turn. For my work with APEC, this included two trips to meetings in Lima. The second was in August. It occurred between meetings in North America leaving a few days during which I took a trip to Machu Pichu via Cusco in Peru. I flew there via Houston on Wednesday, a long & tiring day of travel then met up with an APEC colleague on the Thursday morning for the flight up to Cusco. Cusco is 3,400m above sea level so they recommend a day of acclimatising before doing anything else. Cusco was the Inca capital that was taken over by the Spanish so has some very interesting sights to see in its own right. 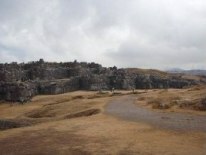 For some quick background on Cusco, have a look at http://en.wikipedia.org/wiki/Cusco. We had a half day guided tour of Cusco & saw the mingling of the Inca with the Spanish. 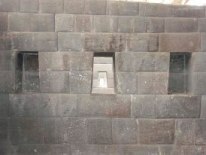 The Spanish habit was to build on top of something significant of the conquered Incas & others, including to show their dominance. The interesting thing from talking to the guide & other local people is that some of the conquest could be seen as superficial, at least on religion – Inca religious motives had to be built into the Roman Catholic iconography to gain the attention & involvement of the locals & some of the adherence to the religion still seems a bit superficial, with continued adherence to traditional rites as well as observance of important days in the calendar etc. There also appears to be some long term, but polite, resentment of the Spanish dominance and more so in the mountain areas like Cusco. 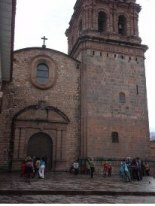 The first place we visited was the Dominican church built on the site of the Inca temples. But sure enough, it turns out that very significant Inca building works remain inside. Apparently this was not known until the 1950s when an earthquake revealed what was underneath the plaster & other covering materials. Here is an example of the stunning stonework. There is no mortar yet the stones fit so closely a cigarette paper could not be slipped between them. The trapezoidal shaping is to proof against earthquakes. And when they want to do a straight line, eg in a wall, it is straight! We saw other sites during the day ending up going to a hill outside Cusco where there is unending religious work & walls. 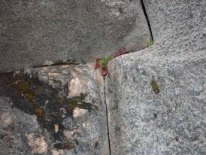 An example of how tight this stonework is can be seen from the following close up. And this work is not as refined as in the temple. 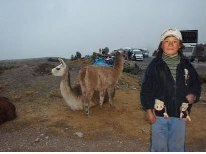 And the obligatory child wanting some coins for posing with the family lamas. But enough of the support act. Off we went on the train to Machu Pichu the next morning, Friday, very early. It is a long ride. All was going well except that my colleague fell down the stairs getting off the train & strained his ankle. While he tried to come with me on the walk to Machu Pichu, he wasn't able to make it. He spent the rest of the day & the next in his hotel room till we started the return trip, poor fellow. It is so remote there was no alternative but to wait it out. Machu Pichu is reached by a zig zag bus climb up the hill from the small town of the same name whose sole reason to exist is Machu Pichu. The best single photo of what it is about is at www.aguntherphotography.com/machupicchu_222mp.html. It is an almost endlessly zoomable picture, so zoom in. For the wiki version of the story, see http://en.wikipedia.org/wiki/Cusco. Then on the Saturday afternoon & evening, we took the train back from Machu Pichu to Cusco, stayed overnight & flew back to Lima on Sunday. It has been an exhilarating break. The APEC work resumed for almost all the following week in the National Museum in Lima.